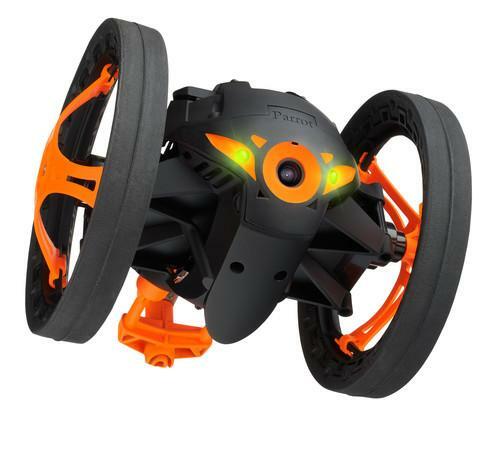 Parrot's Jumping Sumo robot streams real-time video back to its controller. Drone-maker Parrot debuted two new toy drones ahead of the International CES Sunday night. The MiniDrone is an insect-like four-fan helicopter that users can control with an iOS or Android smartphone or tablet. The Jumping Sumo rolls along, and of course jumps, while streaming real-time video back to the same devices. The MiniDrone is a follow-up to the company's AR.Drone, which made its first appearance at CES four years ago. The new bot has large, detachable wheels that let it roll along on the ground before the user decides to send it into the air. See the MiniDrone fly around CES in a video on YouTube. "It is more for indoor [use] and more of a drone for the phone," said Henri Seydoux, Parrot CEO when comparing the new drone to its bigger brother. The MiniDrone is piloted using Bluetooth, while the Jumping Sumo runs over a home Wi-Fi network. It can also create its own if one isn't available. While the Jumping Sumo streams real-time video back to its controller, the MiniDrone doesn't offer any video. See the MiniDrone jump in a video on YouTube. The flying bot will get about seven to eight minutes of flight on a single charge, while the Jumping Sumo about 20. Both can be recharged using a micro USB cable. The Jumping Sumo is capable of jumping 90 centimeters (35 inches) in a single bound. Both toys will be available later this year, but exact launch dates and pricing were not announced.